...hey, at least I didn't title this post "I love U2." You too can review U2, but when you know nothing about music, you're likely to embarrass yourself. But when has that ever stopped me? While I can't comment on the quality of the music with any authority, I can describe the experience, which was, in a word, "awesome" in its original sense. 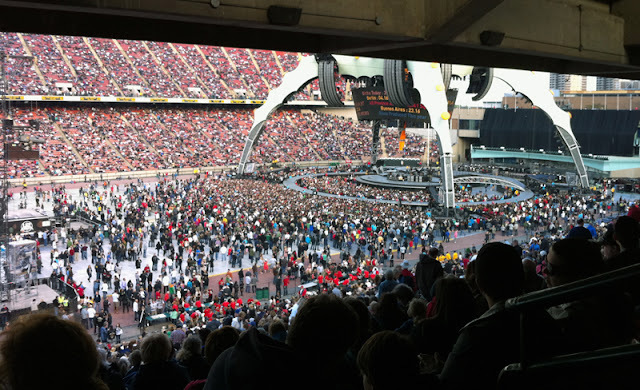 Last night, Sylvia and I and ten thousand others crammed onto buses and LRT cars and journeyed to Commonwealth Stadium to hear Irish supergroup U2 rock Edmonton. Passengers got to know each other intimately as we were crammed together like proverbial sardines. To make matters worse, unloading took so long that LRT cars had to line up, awaiting their turn to offload sweaty music fans. The mood, however, was jocular, with amateur wags cracking jokes and behaving like fools for the entertainment of all. Many folks were bemused by the sudden lack of cell phone coverage, even outdoors; I wonder if there were too many people attempting to send tweets, text messages and status updates about the concert experience. This sudden disruption of technology forced citizens to engage in conversation, and strangers happily traded stories about other concerts and commiserated about the heat in the subway car and the long lineups.The fans were all clearly eager to enjoy the show and these small inconveniences seemed to trouble no one in the slightest. Sylvia and I didn't arrive in time to catch the opening act, but we did find our seats sufficiently early to catch the crowd's self-made half-time show, which mostly involved tossing balloons and doing the wave, as seen above. The 360-degree stage was massive, very nearly matching the height of the stadium itself. Before the show, the interactive display seen in the centre of the upper portion of the stage offered statistics on the current state of the world: population increase, time until coal runs out, etc., very much in keeping with the band's longtime focus on social justice - a theme that wove its way throughout the show, with video appearances by Desmond Tutu and Aung San Suu Kyi. I was struck by the band's entrance, captured here on video. When I saw them striding confidently forward, the first thought that came to mind was "They're strutting out on stage like rock stars." And then I laughed, because of course they are rock stars of the highest calibre, and as performers they're expected to move and talk and look a certain way. With that expectation in mind, I cannot find fault with their performance, either musically or as stage artists. The band members all displayed great stage presence, with frontman Bono manipulating the crowd with deft sincerity and superhuman charisma. Sylvia seemed to particularly favour the drummer, Larry Mullen Jr.
As for the music, the band played flawlessly, at least to my untrained ear, and I found myself quite enjoying some 80s and 90s hits I'd long forgotten: "Where the Streets Have No Name," "Elevation," "Pride (In the Name of Love)," "Mysterious Ways," and even the cheesy theme song from the execrable Batman Forever, "Hold Me, Thrill Me, Kiss Me, Kill Me," which I thought perhaps the band might have disowned given the movie's critical failure. Late in the show, Bono paid tribute to the Albertans displaced by the recent wildfires in Slave Lake, a touching moment during which everyone in the stadium lit up their cellphones - the modern equivalent of holding up cigarette lighters during a concert, I suppose. After the band retired for the night, Sylvia and I made our way back to the LRT station. The crowd was immense, and it took us well over an hour to make the short trip from the stadium to the subway cars. But the afterglow of the concert helped the crowd maintain a sanguine mood, and everyone went home happy, though by the time we hit the sack at 2 am Sylvia and I were pretty bushed. My favourite experience of the night was listening to Sylvia's delirious cheers of delight throughout the concert. I married Sylvia in part because she's fearless about expressing her joy, and that in turn uplifts my mood whenever I see her. As Bono sang midway through the set, there are many reasons to "Rejoice," and Sylvia's embrace of the music and the experience was my impetus for joy last night. Great synopsis Babe. I'm touched that my joy brings you joy. What a wonderful thing to say.